I was wondering, if all lug bolts are the same? I see everything online from 60 bucks to 150, Are they more or less the same? I was thinking to swap them out. I got chrome caps for them off ebay but they were the wrong size. Doe anybody know the lug bolt size? What would you do about this issue? 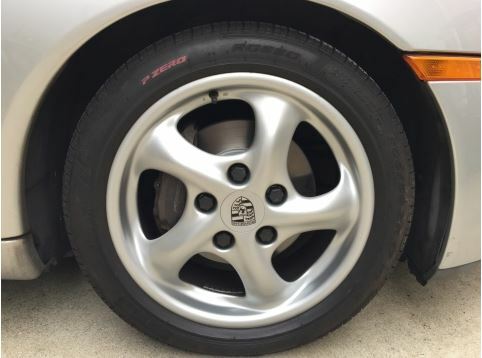 Clean them and paint them with wheel paint. How do I clean them with a wire brush, or do I use a fine sandpaper? You have a good idea! Wouldn't they chip or scratch when installing... torquing them down? I've considered painting mine.... but I fear that the lugs will look crappy with a failed paint job. I refurbished mine by bead blasting them down to bare metal, primed and then painted with a good quality wheel paint. They will last a while if you don't mess them too much. But, if you remove them a few times they do start to chip and will soon look as bad as before. I think a stainless steel version is offed but can't remember where. Last edited by Brian in Tucson; 01-03-2019 at 10:56 AM. Now is a good time to convert to studs! Why? Is there an advantage? If you swap out your wheels a lot, for instance you track your car, studs are the only way to go. With studs, its much quicker and easier as you don't have to hold the wheel to the hub and thread in bolts. Last edited by JayG; 01-03-2019 at 11:51 AM. Found these silicone covers. Also come in silver. I painted mine with wheel paint...did a two at a time on each wheel so I never even raised the car. Yes, they may chip over time but the job is so easy, I'll just do it again. I like that idea. From where did you source them? Yeah, I like Rustoleum. Especially on items that I can bake a little bit in the oven. It does cure the paint a little. I have a rock tumbler with media that cleans fasteners up pretty nice. I like those plastic covers. They are probably reasonably priced. Going the stud route, one could choose any style and coating you want. Would be better than the fugly factory lug bolts Porsche put on our older Boxsters. I have a tool that screws into the wheel that helps guide the wheel back on and aligned so changing a tire isn't quite much an exercise in herding angry cats. Came with the car, I guess, it was in my factory tool roll. I've learned the hard way over the years to always progressively torque up to the factory setting. I don't hardly take my wheels off, except to work on brakes & suspension. And I live in a very dry climate. Banged up, even after almost 20 years the factory lug nuts look just normally ugly. I have two sets for mine and have a friend with a powdercoat shop. The powdercoat seems to hold up better than paint. I tried a special six point socket with a plastic insert but it didn't hold up very well at the final torque spec. The plastic rolled because of the short contact surface of the lug bolt. I did my brakes and spent a bit of time using a drill and a brass wire brush to clean them up. It takes years for them to rust. Clean them up and then prime/paint . If you can cure them in the oven that helps . When removing or installing I use a deep 6 point socket and a plain plastic bag like you get from a store . Hold the bag up to the lug bolt and slowly slide the socket onto the bolt . The plastic is enough of a barrier to protect the paint . These came off Amazon, just search for silicone lug nut covers. Around $8-9. Good luck!